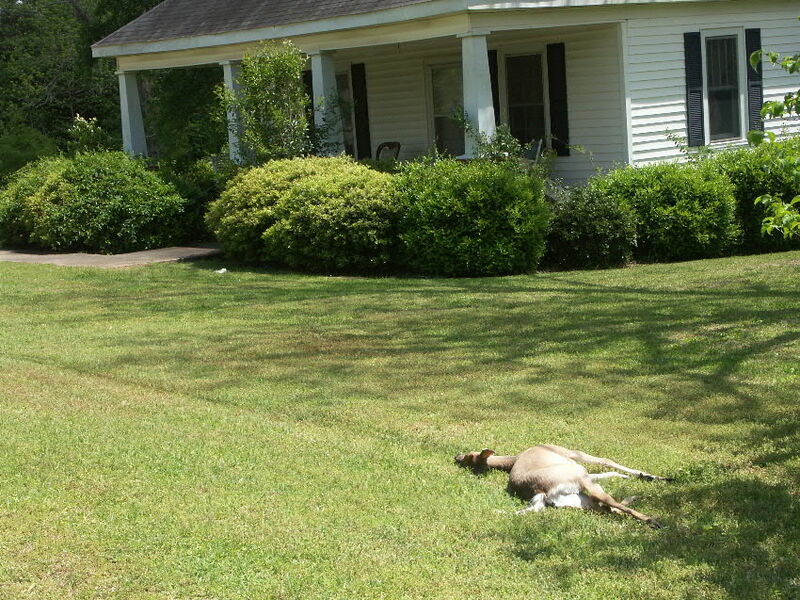 Could you process this road-killed deer if it appeared in your front yard? Still photographs from a 40-minute video have been used to make a 7-minute narrated slide show on cleaning road-killed deer that has been posted on YouTube. This may be accessed via the following link: http://www.youtube.com/watch?v=D81amAtqaao. The deer gutting part of this video is shown in an earlier post, “3-Minute Video: Gutting a Road-Killed Deer” for those who would like a “live” segment. Salvaging road-killed deer is something that I do as I need fresh meat to supplement the deer that I take by hunting. Any meat in excess of what I can use is given away. There is considerable difference between a hunter salvaging meat and a butcher cutting meat for a market. It can, with justification, be said that what I am doing is not “sanitary” in that I am not working in a “sterile” environment with all stainless steel components, using knives that may have been contaminated with body fluids, working with my hands, exposing the carcass to the air, insects, and so on. All of this is true, yet the food that I serve has never sickened anyone. How do I get away with it? We Southerners cook our food. Nothing is served rare or bloody. In the case of stews or ground meat used in spaghetti sauces, the meat is first fried and then boiled – double cooked if you like. Any discolored, stained, dirty or bloodshot meat is put in a pot and boiled for the dogs. Even after it is frozen, the exterior muscle sheaths are removed and any discolored meat is discarded as the meat is cut. Prior to cooking, the cutting boards and knives are washed, and re-washed between stages in the process. Implements used on meat are not used to cut raw vegetables or anything else that is going to be served raw, like salads. Take prudent care, cook your wild meat well done, store it properly, don’t let it sit out (cooked or raw) and all will be well – even if the animal was a road kill. For those in pre-med or pre-vet programs, doing your own road-killed deer not only will give you a head’s up when you start on your anatomy programs; it will also cut your food expenses. State laws vary considerably on if, who and under what circumstances a road-killed deer may be in possession. Some flatly prohibit it, others permit anyone to salvage any dead deer on the public right-of-way while still other states require a road-kill possession tag. Know your state laws before picking up a deer.